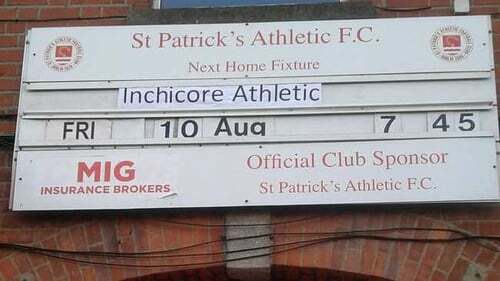 The Inchicore Athletic faithful will walk en masse to Richmond Park on Friday night for a dream FAI Cup derby against a club most of them support passionately - St Patrick's Athletic. The draw for the first round proper last month paired the Leinster Senior League men with the mighty Saints, a brilliant tie for the underdogs whose Bluebell base lies in the shadow of the Airtricity League Premier Division club's famous stadium. Inchicore currently play their home games at Pearse Park in Crumlin [who they beat in the qualifying round to set up tonight's showdown], renting the pitch while a new state-of-the-art astro is being built closer to home. Tonight's game has caught the imagination of a tight-knit community, with young and older generations far and wide coming together to get behind their team. "It’s absolutely massive," club chairman Michael O'Shea tells RTÉ Sport. "It brings a great buzz to the whole place. Everyone is on a high. It’s not just the players, it’s the people involved with the club, the kids around the area. "A lot of them go down to Richmond Park every Friday night. There’s a line between the two clubs really. "There’s people originally from Inchicore who are coming back from the likes of Denmark and England just to watch this game. It’s raised an interest everywhere. "The kids will be all dressed up in their finery to come down to Richmond Park." There's a history of non-league clubs bloodying the noses of big names in this competition. Last year Bluebell United strode into the quarter-finals and really pushed Shamrock Rovers before going out on their shields after a 4-2 defeat. Most famously, St Francis made it to all the the Lansdowne Road decider in 1990 where they lost 3-0 to Bray Wanderers. In a link to that fairytale run, Inchicore boss David Hyland is the grandson of St Francis co-founder John Hyland. It would be a shock of monumental proportions if Inchicore were to even avoid defeat - they play in the third tier of the LSL - but they do have some LOI pedigree in the side. Player-assistant manager Stephen Quigley was on the books at Pat's until 2007 before moving on to Dundalk, Shels, Drogheda United and Bray. Defender Mark Donoghue is a major influence, while young centre-midfielder Darren Howe has turned heads in the league with several high-quality displays. "Most of our players are from that Dublin 8 area," O'Shea adds. "There’s experience through the side. We like to think we can keep the score down and have a good go at them. The whole plan is to get the defence sorted early, contain them for as long as we can and have a good go at them. In a cup game, anything can happen. "We’re getting a new astro pitch, it’s exciting times for the club. "We play over in Pearse Park in Crumlin. It’s not ideal for us, we’re renting. With the new pitch... we’d be back home then. It’ll be somewhere we can say, ‘this is our base’, make it a stronghold." St Pat's are refusing to concede defeat in their proposals to build a new stadium in Inchicore despite the confirmation three weeks ago that 472 houses will be built in the area instead. Their dream to construct the Richmond Arena as part of an overall City Development Plan that would include new houses, a shopping complex and an underground car park has the support of many locals. It's a vision to put soccer at the heart of a soccer-mad community and Inchicore's trip to Richmond encapsulates the passion for the sport in the area. A famous win would be celebrated for years; a home victory would see most of Inchicore's players and fan base weigh in behind Liam Buckley's men for the rest of the competition. It is, stresses O'Shea, "a dream tie". "I think the players will leave everything on the pitch for the club and try to do themselves proud and the club proud, which they have done all season. "The way we look at it, it’s a celebration of football between two long-established teams in Inchicore. It’ll be a great occasion."